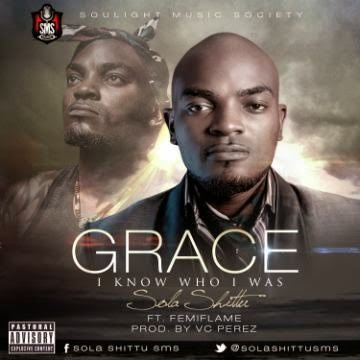 Produced by the legendary VC Perez and featuring vocal genius Femi Flame, GRACE is a healthy mix of great lyrics and well crafted beats that will draw you to look on the inside as the song makes its progression. It is a track everyone can relate with, as the message is not in any way ambiguous. Sola Shittu is a prolific songwriter, singer, broadcaster, minister and dancer. He decided to use hip hop (a genre he has taken by storm) as a medium to express his inner convictions about spiritual and contemporary issues of our days. This is evidenced in the lyrics he spits, either in his own songs, or when featured on hit tracks. He is always at ease when sharing his faith on any platform. With a unique delivery style that is difficult to ignore, his rap verses has become the toast of lovers of great music across genres, as his infusion of indigenous language and deep understanding of rhythm makes his songs hit the mark ten out of ten times. He has released various singles, and has been featured on hit tracks by many top artistes. He has shared the stage with musicians like: Buchi, Tolucci, Wole Oni, Sola Allyson, Okaysokay, Gameman, Provabs, D Bass, Samnen, Truesouth, Samjamz, Push and many others. “Can I claim to be a Christian when I feel so irresponsible?” he sang in ‘GRACE’. The song is a fusion of calls to passion, purpose and purity, and is a pure reflection of what God is willing to do in a man’s life, if he will not turn down the offer.